This won't have any real effect on you, the consumer, but it's still interesting to note that with yesterday's launch of the PS3 Slim, Sony were doing more than redesigning a plastic shell. They were rebranding the entire console. One of the countless press releases we received from Sony yesterday gave implicit instructions that we were to cease writing PlayStation 3 as PLAYSTATION 3 (which is how it had previously been officially referred to as), and simply call it the PlayStation 3. Which is what we've called it all along anyway, but it shows that Sony may be coming around to the fact nobody appreciates the guy on the internet that USES CAPS ALL THE TIME. 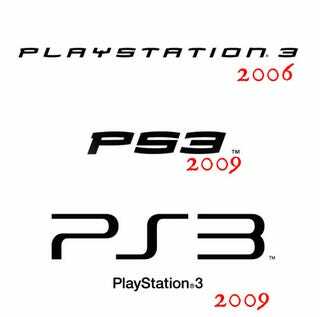 Also different - and more interesting - is the redesign of the console's logo, which is now the third in the PS3's short lifespan. When the machine was first released in 2006, it was emblazoned with a logo that said "PLAYSTATION 3" in what's best known as the "Spider-Man" font. Looked a bit silly, but that's what Ken Kutaragi wanted, so that's what went on the thing. Earlier this year, however, things changed. Those watching trailers for PS3 games would have noticed a new logo, with the name truncated to the briefer "PS3" (though this was still in the "Spider-Man" font). Now? Now you can see it's changed again to a gentler shape, more reminiscent of Sony's earlier logos for the PS2 and PSP (though slightly more rounded). Which is funny, since introducing a new logo so quickly after introducing the last new logo was one of the key reasons I thought the original, leaked box shots for the console were fake. And finally, even the software is in line for a change, with Japan's Gundam bundle confirming earlier rumours that the PS3's game boxes have been redesigned, with the giant "PlayStation 3" spine replaced with something a little classier. So, as you can see, the Slim isn't just a smaller, cheaper PS3. It's a PR reboot of the entire console, from design through to the game boxes and right on through to the advertising. Guess it needed a clean slate, huh?